This week’s pick is Ancient Battle: Alexander, a very cool new strategy war game from Hunted Cow Studios. Hunted Cow have been bringing some excellent war games to the iPad for years now. I did a review of the Civil War: 1863 iPad game back in 2012. I enjoyed the heck out of that game and I’ve happily bought and played a Civil War follow-up and a couple of World War II tank games they’ve released over the last couple years. 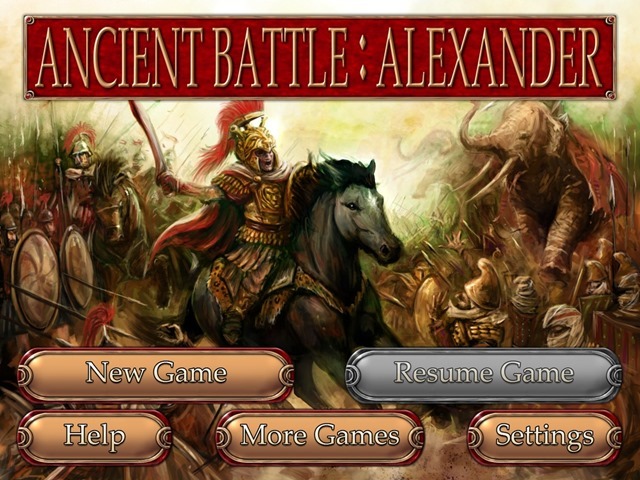 Ancient Battle: Alexander is their latest release and covers one of the great military leaders of ancient times – Alexander the Great. Use Macedonian Phalangites, Greek Hoplites, Indian Elephants, Scythed Chariots, Persian Cavalry, Catapults, Archers, Slingers, and many other unit types to engage in classic battles. • High Definition Ancient Era Graphics. • 7 Mission Tutorial Campaign. • 8 Mission Greece Campaign playable as the Macedonians or their opponents the Athenians, Thebans, Illyrians, Getae, Thracians and Triballians. • 7 Mission Persia Campaign playable as the Macedonians or their opponents the Achaemenid Persians and Spartans. • 5 Mission India Campaign playable as the Macedonians or their opponents the Classical Indians and Scythians. • 48 Unique Ancient Units. Hunted Cow’s iPad war games are not as deep and strategic as those being published by Sheandoah Studio – like Battle of the Bulge and Drive on Moscow – but they offer much more in the way of graphics and a bit of ‘live action’ so to speak when you engage in combat. If you enjoy war games and strategy the games from both of these companies are going to bring you lots of enjoyment on the iPad. I’ve only just got Ancient Battle: Alexander installed and worked through the tutorial campaign. When I’ve played through more of it I’ll look to do a review. Here’s an App Store link for Ancient Battle: Alexander; it’s priced at $1.99 and is a universal app designed for both iPad and iPhone.